“Better dead than slaves”. 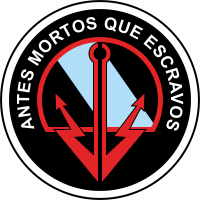 Motto of the Irmandinho Boarding and Rapid Disembarkation Group. The members of the Brotherhood of Waterborne Surveillance Volunteers, more commonly known as Irmandinhos, act as a shock force capable of disrupting small heavy infantry or forward light infantry units. Over time they have become a permanent military Waterborne Exploration squad, forming the Boarding and Rapid Disembarkation Group. Irmandinhos do not receive regulated military training, but instead learn the basics by working alongside veterans of the Irmandade, making them an irregular unit. The Irmandade has long been suspected of smuggling all manner of merchandise between Ariadnan communities and the foreign colonial settlements, and they certainly have the means and expertise to move goods unseen in their swift watercraft. They are also believed to have contact with the Intelligence services of all nations of the Sphere with presence on Dawn, which may give credence to the theory that they are a key piece in some secret espionage ploy of the Cossack High Command. At any rate, an Irmandinho will buy or sell anything, that much is known: if it’s broken, he’ll fix it; if he can’t fix it, he’ll use it to bash someone’s head in. Rough, tough and boisterous, Irmandinhos are kept under lock and key and closely monitored while aboard Ariadnan craft, for fear they will start some trouble or ‘nick’ something, at least until things get nasty… that’s when they are let out to hurl themselves towards the enemy. This page was last modified on 7 April 2018, at 14:53.